Sew Mama Sew! is hosting their biannual Giveaway Day again and I thought it would be fun to participate. For those who are new to our little ol' blog, welcome! It's always nice to meet new people, so please make yourself at home and take a look around. Miss Molly or Miss Jenny PDF pattern. *For more information about these prizes, click on the shop bar and head over to my shop for product details. -Leave a comment on which prize you'd love to win. -Followers get extra entries, just leave another comment that you follow. -Be sure to leave an email address in your comments. Giveaway ends on December 7th at midnight(PST)and two winners will be announced on December 8th. Please be sure to visit Sew Mama Sew! blog for more fabulous giveaways. I'd love the hoodie scarf! Wow that Kawaii Hoodie Scarf is adorable..I would choose the pink ;) Thank you! I would love the pink hoodie scarf! Thanks for the chance! I love your apron patterns! I think my favorite is the Miss Molly apron. I would love to win one of the hoodies. They are really cute. My daughter would LOVE the hoodie scarf! And, it looks like we are going to be in for quite the winter where I live! I would love the Molly Apron Pattern! Oh! That hoodie scarf is adorable! I've got two little girlies, and we live in Colorado, so something cute to keep their little ears warm is a must! :) Thanks! Oh. my. goodness. I LOVE the bear hoodie scarf. Gah, I want that so badly for my daughter! I would love to win the hoodie scarf for my daughter! :) They're adorable! I would love to win one of those hoodies! So lovely and clever! I already own too many apron patterns, but I would totally like to get my hands on the Miss Jenny pattern. Too cute! Thanks! The miss Jenny would definitly be my first choice but I love the hooded scarf Too. I'd ove to win the hodie scarf, thanks so much! IThey are so cute ! Id love to win a hoodie scarf. I'd love to win a hoodie scarf. jess [dot] whyte at that gmail place. Those hooded scarves are amazing! I saw your hoodie scarves a few weeks ago and love love love them!!! They are just so cute! Oooo!! Pick me. I love love love the Kawaii Hoodie Scarves! My 2.5 year old lady would die over one of them. No joke. They're so cute! Thanks for an incredible giveaway, I love your blog!! Oh and I'm definitely a follower!! The pink hoodie scarf is adorable, never seen anything like it before. Brilliant! Would love the apron patterns...or the hoodie scarf! They are both great! A hoodie scarf for sure! I've even got the sucker pinned! Love those cute hoodie scarves. Hoodie scarf all the way. That hoodie scarf is so incredibly cute, but I don't know any people little enough for one, so I'd go with an apron pattern. Oh I love the Kawaii Scarves, too cute. That would be my pick. Thank you for a great giveaway and a chance to win. Two winners! Woot! Woot! You Rock! Holy cow, I NEED one of those little hoodie scarves! So Cute! The hoodie scarves are great! Thanks! I LOVE the hoodie scarf! the little kawaii hoodies are so cute! I'd love to make one. I love the Molly apron pattern! 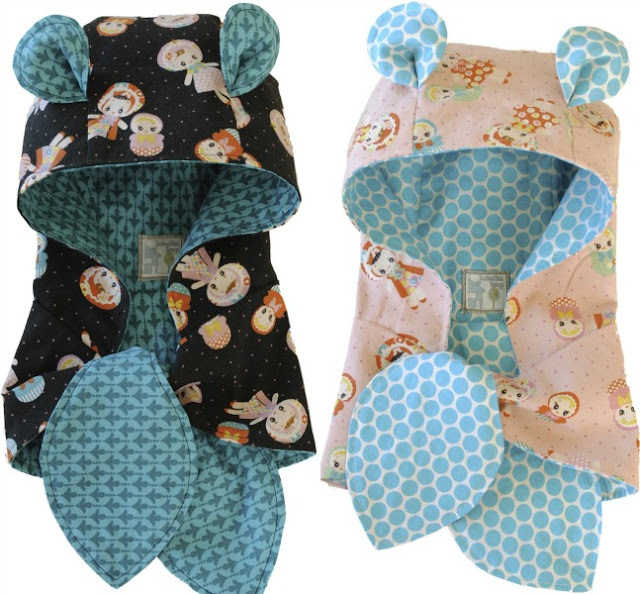 Oh my goodness I would love to win Kawaii Hoodie Scarf! My littlest would just love it =) Thank you so much for the opportunity! I definitely have to go with the hoodie scarf. My little one would flip out for one of those. They're so cute. I'm following you via Google Reader! So cute! I am torn between a hoodie scarf and Ms. Jenny Apron. Thanks! I'd love to win the Miss Jenny pattern. So cute! Thank you! All of them are so cute!!! I think I'd like to win the Miss Jenny pattern though. The scarf is too cute for words & I am sure my daughter would never take it off. The hooded scarves are fantastic!! I would love a hooded Scarf for my little guy, these are the cutest things EVER! I prefer the scarf, it's lovely! Definitely would love that hooded scarf! Thanks for the giveaway!!! those hoodie scarves are DARLING! i have two little girls who would want one... thanks for the chance! I love the hood scarves! So adorable! This would be perfect for my daughter -- it's hard to keep that girl bundled up in the winter! Love the Kawaii hoodies! Just adorable!! I'd love to win a hoodie scarf- they're so cute!!! those hoodie scarves are way too cute! The Miss Jenny apron pattern! So cute! I would love to win a hoodie scarf. That is so cute. I like the Miss Jenny Apron pattern! How cute! I would like to win a hoodie scarf. Thank you for making it open to all. Much appreciated. I would like to win the Kawaii Hoodie Scarves. The Miss Jenny apron or the Kawaii Hoodie. I've never seen the hoodie scarves before. They are awesome ! I would love to win the Kawaii Hoodie Scarves. I would think a apron pattern would be fun. hoodie scarf is so lovely!!! Forgot to put my email on previous comment! The Miss Jenny apron is what I'd like to win. I would love to have a hoodie scarf for my eleven month old son. Awesome prizes. I'd love to win the Miss Jenny Apron pattern. I can think of a couple friends to make this apron for and of course one for myself! I would love the Hoodie Scarf, so cute! I love the hoodie scarf - so adorable!!! I would love the Kawaii Hoodie Scarves!! I would love to see my little girl in one of those adorable scarves! I would love to win a scarf. I have 3 girls ages 5 days old-4 years! I would love the hoodie scarf! i follow via email=thanks=love your stuff! I love the Miss Jenny apron! Thanks for the giveaway! I would love to win the apron patterns! I would love the apron patterns. Miss Jenny is lovely. =) Thank you. All are adorable... Miss Jenny apron is my favorite! Thank you! I love the pink hoodie scarf! It would look so darn cute on my four year old! Oh the pink hoodie scarf, please! The hoodie scarves are so adorable! This is a great idea! I love the hoody scarves- so, so cute! the pink one for my daughter would be lovely. U m, those hoodie scarves are to die for!! I love the hoodie scarve! I would love the Miss Jenny Apron. Oh! I would love to win the Kawaii Hooded Scarves. :) So cute! thanks for the awesome giveaway. I am your GFC follower. I love the hood scarf, my daughter would be in love with the black and blue one. Thanks for the giveaway. I like the Kawaii Hoodie Scarves, I could picture my niece one of those cute as can be. Oh I love the Kawaii Hoodie Scarve, so cute!! Gah! Those aprons are adorable!! I am now a follower via email! You have super cute tutorials! I love your hoodie scarves ---they are adorable. My daughter would love either, but would probably prefer pink. Thank you! I'm a new follower. Thanks for doing the giveaway~! Love your apron pattern...Thanks for the chance! The hooded scarf is the cutest thing!! The hoodie scarf is so unqiue! Thanks for counting me in. I'm going to have to go with the apron. My littles are just a smidgen too big for the scarves - although my bean would love it! Those hoodie scarves are too sweet! Thanks for the chance! I'd love to win the hoodie scarf--so cute! I would choose the black hoodie scarf. Do you have a pattern for sale? I'd love to choose the black hoodie scarf! But since they're not, I'd choose the Miss Jenny Apron pattern. The pink hoodie scarf! Thanks for the giveaway. I love the hoodie scarves! so cute! Those scarves are fantastic! Thanks for this giveaway! I would love to win the scarf for a friend's girl...or the apron pattern for me! I love the unique hoodie scarves! Cute stuff. Thanks for the chance. The hoodie scarves are sensational! I have recently come across the snoodie concept and love it. Yours are lovely and I am so keen on them I will have to try to make one myself anyhow! So cute! I love both, but living in Hawaii, I'd say the apron pattern. Thank you! Alright. I've gotta enter your giveaway. Those scarves are just too insanely fantastic. I'd love one of the patterns! Thanks for a chance to enter! I like the miss jenny apron. Thanks! Oh my goodness, you have some serious talent! I'd love to win the light colored hoodie-scarf. It is so darling. My little peanut will look so cute in it! 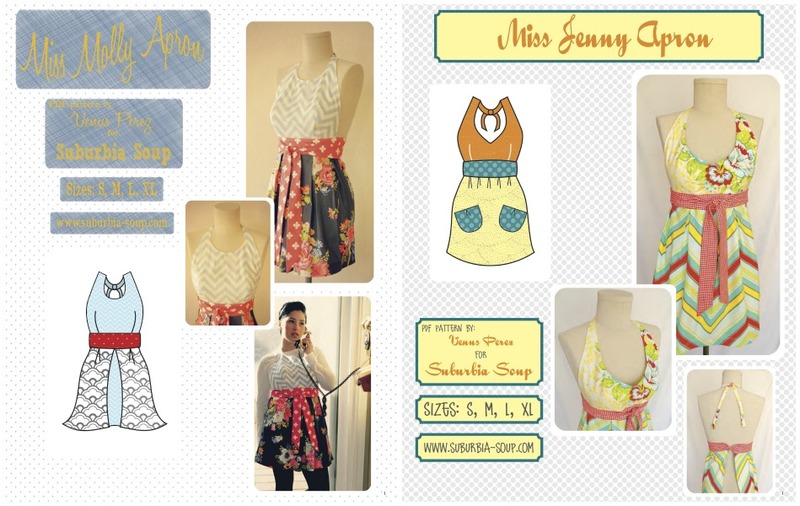 I really would love to win the miss Jenny apron pattern. It is very cute. Miss Jenny Apron, super cute! I love love love the scarf! So cute!!! I love the Miss Molly Apron! I love them both - probably would pick the cute hoodie scarf! To darn cute! thank you! I would love to make the Miss Molly apron. Thanks for such a generous giveaway! Great prizes! I would pick the black hoodie scarf - so cute! I really can't decide which one I would prefer! I think I would have to go with one of the apron patterns! Thank you for the great giveaway! Oh, the hoodie scarf, it's so cute!